More reason to further deepen the topic: the debate opens tomorrow, April 6th, from 10 am (CET). Just follow the hash tags #CarbonaraDay and #CarbonaraChallenge to participate in a virtual event that will see bloggers, food influencers, journalists and chefs sharing opinions, photos and tips on Twitter, Facebook and Instagram about this dish and, more generally, about the relationship between tradition and contamination in the kitchen. VEGETARIAN, ANTI-WASTE, LIGHT OR EMPTY FRIDGE: ALL THE CHALLENGES OF THE CARBONARA – Increasingly, the Carbonara “photographed” on Instagram is presented with an alternative pasta shape to the classic spaghetti (which is still the most popular). Among the others, the short pasta is nice, with rigatoni, mezze maniche and fusilli above all. And the desire for Carbonara also increasingly crosses with whole meal pasta, which adds to the dish the well-being of the fibers and a more complex flavor with scents of wood. Speaking about alternative versions, the vegetarian Carbonara with zucchini, artichokes, pumpkin, and mushrooms instead of guanciale, or fish (sea and lake), more delicate and fragrant, is also strong on the social networks. There is the “Royal” one, with truffle, and the anti-waste one, where the pasta is prepared with indirect cooking to save water and energy or the spaghetti are those of the day before, but in flan. And on the net you can also find tips for Light Carbonara: only 1 egg yolk for 2 people, microwave degreased guanciale, turmeric to add to pepper. From one extreme to another, there are those who make a virtue of necessity with the fridge emptying Carbonara, using substitute ingredients of the territory (bacon, speck or ‘nduja instead of guanciale, parmesan instead of pecorino) because “he had no time to do the shopping” or, more simply, “he was longing for Carbonara” even if he did not have all the necessary “orthodox” in the pantry. And those who instead show their love for tradition by posting not the finished dish, but real still lives of expensive and valuable niche ingredients, purchased directly from the producer or the farmer. THE ESSENCE OF CARBONARA: WHAT IF IT WAS STREET FOOD OR SPREADABLE? – The last trend is, perhaps, the “Essenza di Carbonara”: a dish-concept that keeps the visual and taste elements of the Carbonara, namely creaminess, flavor and crunchiness, but made with totally different ingredients: an example is the Carbonara with a recipe based on whole meal pasta, cream of yellow tomatoes and Tempeh. Or, as some chefs have thought (see Focus 1), deconstructed and recomposed for different occasions of consumption. Like the “Supplì of Spaghetti alla Carbonara” designed by Gabriele Bonci, or the “spreadable Carbonara” signed by Elio Sironi. And even when the Carbonara is prepared fulfilling the tradition, there are several exceptions: the result is the same, but it can be achieved in different ways, thanks to online tutorials or family tricks. For the creaminess of the egg, is it better to cook in a bain-marie over the water used to cook the pasta or to cook it cold in a boule far from the stove? What is the right size of guanciale, square or striped? Should it be cooked slowly or quickly? A VIDEO ON THE “WRONG” CARBONARE OF YOUNG PEOPLE AND THE ADVICE OF MONOSILIO CHEFS – A gem: for this third edition of the #CarbonaraDay, Unione Italiana Food offers Carbonara lovers around the world a video – in Italian, subtitled in English – on the comparison between tradition and innovation in an ironic and light key. 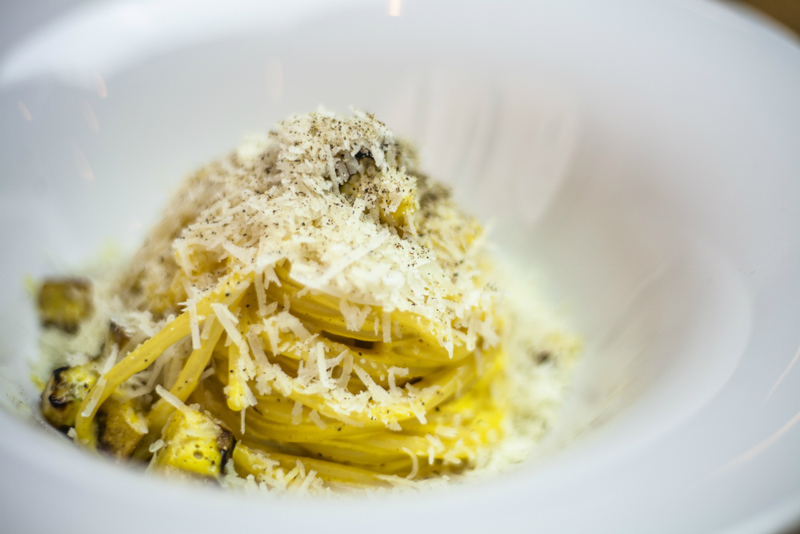 On the one hand Chef Luciano Monosilio, the best interpreter of traditional Carbonara. On the other hand, questions and provocations from the young students of the “La Cucina del Fuorisede” community who imagine the future of this dish. They give advice on how to create an alternative Carbonara that respects tradition: with whole meal pasta, with a different shape or with alternative ingredients, according to taste and what is in the pantry. The video will be published on the social channels of WeLovePasta, the platform of Unione Italiana Food dedicated to pasta lovers. ABOUT A DISH OF UNCERTAIN ORIGIN … WHAT IF IT’S YANKEE? – Perhaps Carbonara is so loved and replicated because its origins are uncertain and no one, not even in Italy, can still take it 100%. For some, this traditional dish would have more recent origins than you might think. The first hypothesis is that the Americans would have invented it. It was born in 1944 from the encounter between Italian pasta and the ingredients of the ‘K Ration’ of American soldiers (egg yolk powder and bacon). Going back up the Peninsula, the American soldiers accompanied the ‘K Ration’ to the spaghetti to supplement the dose of carbohydrates. A curiosity: the inventor of the K Ration is Ancel Keys, who, years later, would “discover” the Mediterranean Diet! This thesis is also supported by Marco Guarnaschelli Gotti, author of the Great Encyclopaedia of Gastronomy. The second hypothesis is that the dish would have been ‘invented’ by the charcoal burners of the Apennines (carbonari in Roman dialect), who prepared it using ingredients that were easy to find and preserve. The Carbonara in this case would be the evolution of the dish called ‘cacio e ova’, of Lazio and Abruzzo origins. A last hypothesis would lead the origin of the recipe back to Neapolitan cuisine. This thesis identifies in some of the recipes in the 1837 “Cucina teorico – pratica” by Ippolito Cavalcanti a possible origin of the dish.